I am an avid birder, and I did a lot of research in my quest to find the right pair of binoculars. I finally settled upon the Celestron 71332 Nature DX 8×42 Binoculars, and I have been very happy with my decision. They have a lot of features that make them a tremendous value, and I have found them to be dependable and durable. Here is a further look at the reasons I love my pair of Celestron binoculars. The first thing you need to look at before buying a pair of binoculars is the lenses they sport. This is an area where the Celestron 71332 Nature DX 8×42 Binoculars really shine. These binoculars come with BaK-4 Prism lenses with phase coating. The prism lenses do a great job of magnifying the light. This really helps when I take the binoculars out on a cloudy day. It is awesome when I look at something through a misty background and it pops crisply into view with these amazing lenses. The lenses phase coating is the best you can get. The fully multi-coated optics means that the maximum amount of light gets through the lenses at all times. I never have to worry about dim images when I use these binoculars. Another thing I love about the Celestron 71332 Nature DX 8×42 Binoculars is how amazing the focusing process is with them. I have owned many pairs of binoculars over the years, and I have discovered that focusing capabilities is one area where many binocular manufacturers struggle. It seems like it is very difficult for binocular makers to create a focusing mechanism that gives a proper feel. That is not the case with these binoculars. The focus knob is very easy to use. It slides back and forth as smooth as silk. I never have to worry about the focusing dial getting stuck, which really helps a lot when I am quickly trying to get a distant object in view. This easy-focusing is especially helpful when I am trying to get a fast-moving bird in the frame. When I do my birding, I do much of it out on the lake. This means that I need a pair of binoculars that can hold up to some rough usage out on the water. 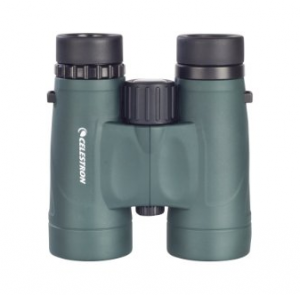 The Celestron 71332 Nature DX 8×42 Binoculars have never failed to disappoint me in this area. First of all, they come with lens caps for all the lenses, which means I don’t have to worry about water splashing on the lenses when I am speeding around the lake. The durable construction of the housing also means I don’t have to worry about dropping them. I have a bit of a reputation for my butterfingers, and I have proven it a couple of times with these binoculars. They have never come out the worse for wear, and this includes a couple drops onto hard surfaces. The Celestron 71332 Nature DX 8×42 Binoculars are also waterproof, which really comes in handy when you use them in wet conditions often like I do. I have dropped them in water and had them out in pouring rains, and they have never suffered any issues even in the wettest conditions. I have been really happy with my purchase of the Celestron 71332 Nature DX 8×42 Binoculars. If you are looking for a durable, dependable, brilliant pair of binoculars, you can’t go wrong with these. They do a wonderful job of bringing objects both near and far into view, and I have been repeatedly amazed with the brilliance of the images.